Pregnancy causes some strange food cravings. Last night I had a dinner party for some friends during the college football national championship. Many were new to game, so I wanted to trot out some good food without asking them to get out of their comfort zones. I made a ham and Canadian bacon from a wild boar, a Thai dish with fried dove, some squirrel confit and wild boar gnocchi with marinara sauce. Yummy, but safe. 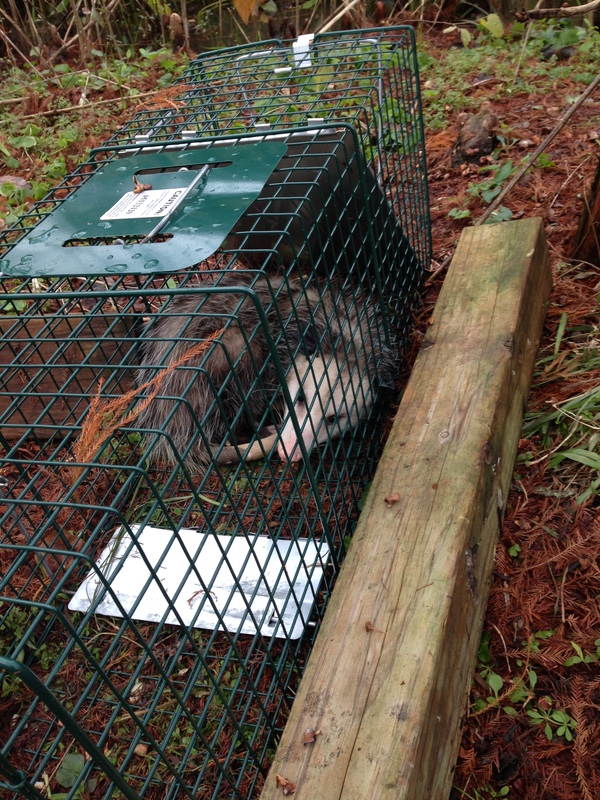 Didelphis virginiana, the ubiquitous Virginia Opossum, growled and hissed at us as we approached the trap. Named by John Smith in 1604 after the Algonquin word for “white animal,” scientists believe they’ve been around since the dinosaurs. Of course they are North America’s only marsupial and have more teeth than any animal on our continent. They are practically immune to snake bites and rabies, are famous for playing dead when threatened, and will burp at you when agitated. Males are Jacks and females are called Jills, and if you run into several, well, you’ve discovered a passel of possums. With no intention of actually following through with the proposal, I asked my guests in a text if they’d like an additional item on the menu. I followed the text immediately with the picture above. I expected revulsion. Nope. In fact, the two pregnant and only non-Southern women delighted at the prospect of possum. The rest of the party then joined in with demands for possum. Well, not wanting to peeve the parturients, I skinned and butchered the critter. For some reason, the prospect of eating Mr. Slicktail kinda got to me. I don’t know why, but I had trouble envisioning it being food. Yet, I persevered. I’ve always said the best bait for catching a possum would be a saucer full with drippings from the back of a dumpster truck. These animals eat anything. Dead horse? Not only a months worth of meals, but a house to live in as well! It was common knowledge in Camp County in the 1930’s you needed to keep a possum under a potato crate, fattened on a diet of sweet potatoes for a month, before you had prime eating. The meat was pink, not unlike pork, but more tender. They only live to be about 4 years old, so maybe they don’t have time to get tough. I decided to brine it, and keep the spices on the sweet side. I expected it to yield the aroma of soggy wet trash, with hints of vomit. I guess you could say the bar was set pretty low. Turns out I was wrong. During the roasting time, it smelled like a pork roast. Everyone dug in. The two preggos went back for seconds. I’d say if a pig and squirrel could have a baby, it would taste like possum. In fact, during my research I discovered the appropriate way to butcher a possum is to scald it like a pig, leaving the skin on. Maybe next time. Simmer brine to dissolve salt and sugar, allow to cool to room temperature. Add the possum and brine for 24 hours. If necessary, add a plate to keep the meat fully submerged. Remove from brine, rinse and pat dry. Combine the flour, salt, pepper and thyme. Coat the possum with flour mix. Place in a roasting pan at 350 degrees, uncovered for an hour and add the wine and water. At the end of the hour, add the sweet potatoes. If necessary, add more wine and water. Cover and cook another 45 minutes. Add the cored apples, and the rest of the spices and return and cook covered for another hour. This was a pleasant surprise. If you are adventurous, give this one a go. So, any of you ever dined on possum? So, my dog killed an opossum a month or two ago (he does not abide small mammals in the yard. He sort of… mashed it to death against the fence with his body and teeth). It *stunk*. Like, musky weird stink, not burst internal organs stink. Had to bathe the dog twice. Now cannot imagine opossums and food in the same category. Well, I’ll say this…its much grosser to clean one. However, as far as food goes, if you didn’t know it was possum, its totally fine. Diver ducks taste a whole lot worse, and the way I cooked this one it came out well. you stated to combine the flour, salt, pepper, and thyme, but never said how it is to be included. Please clarify. Thanks Michael, my fingers were greasy and I forgot! Fixed it. I’m sorry, Andy! I’ve gotta say that I made a face as I read this post. I think I’m still making a face. It’s funny, ain’t it, that, with all the critters we eat, possum elicits such a response. It was difficult to butcher and I had to call out my manhood a few times. They just don’t look like a mammal should. But, looks can be deceiving! Wonderful post! I can’t imagine eating one of those nasty critters but good for you!! Well, I had my bluff called by some large of pregnant women! I think these animals are moving north, so perhaps I’ll get my hands on a carcass eventually – in which case will certainly give this recipe a go. The thing is, I guess because they are marsupials, they just seem nasty. I think its because they are such slow movers. But I guess they are hardy enough to have survived this long and will make it up to you Hilda. An old rural legend floating behind the pine curtain in NE Texas states that if you put a possum inside a greasy 55 gallon drum, no other animal can beat it in a fight…. Hmm. I would bet on our raccoons myself, although I would love to see a species that can scare them. Thank you for the post and recipe. My son and I are trying to catch a possum that gets into our backyard. We want to raise rabbits and don’t want possums to prey on the babies. Just as important, I want him to learn that killing an animal comes with responsibility. Your recipe would be the perfect way to complete the lesson. Thanks Lee, I haven’t written much in a while and just saw your comment. Glad to be of service.